I’ve decided to apply Permaculture Design Principles to my little 10 acre patch of land which used to be farmed for corn and soybeans. I planted it in tall fescue in about 2003 before I had any knowledge of permaculture and it has terraces and a couple of drains which were placed by the row crop farmer long before I owned it. I currently have a small temporary dwelling back in the woods and I would like to have some rotationally grazed animals this year if possible. Of course, water catchment is my first priority, then planning for beltways of trees would be next. I have been following the work of Darren Doherty and I’m a bit familiar with Geoff Lawton’s work as well. Today I was alerted to a man who has a hybrid model for land development – a mix of the features of both Darren and Geoff’s work. His name is Cam Wilson and his blog article is HERE. My land is pictured above. 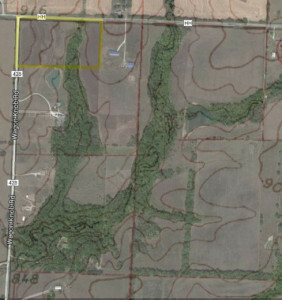 The yellow outline is my little 10 acre patch and I have superimposed contour lines on the property. 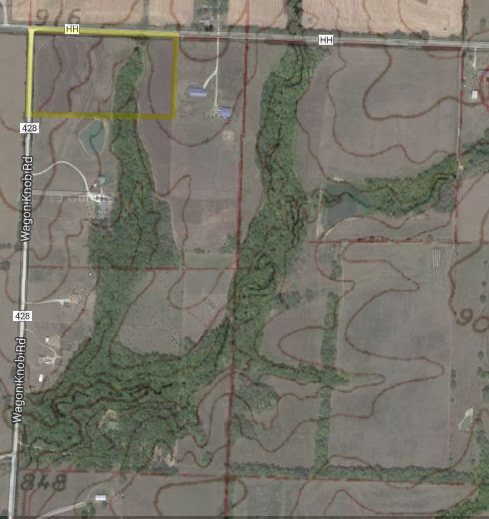 However, the contour lines may be old, possibly done prior to the terracing by the row crop farmer pervious to me.